Combe hit hard by a Hertford side on song. Any hopes that Combe might this weekend turn round their season were quashed as they came up against a Hertford side on top of their form. Hertford always present a stiff challenge especially on their home ground. The home team were on the button in attack and defence, and keen to deny Combe any space or opportunities. Hertford rattled in five tries, all by wingers. Combe in reply ran in two, both by wingers, in some small consolation. After rain earlier in the day the sun was out for kick-off and a well-fed, large home crowd were determined to enjoy their day. The first quarter was scoreless. From the start Hertford’s second row was almost over the line but was tackled short, then after a drive from a line-out the other end, Combe’s Will Robinson made space for Dave Bonner who was on his knees just inches from the try line. Thereafter it was stalemate as both sides ran through the phases without making big dents in defence. Hertford’s other second row was clear and had support. Desperate Combe defence conceded a penalty in front of the posts and full back Sean Taylor had the first of his successful kicks at goal. 3-0. A burst of activity. Hertford chipped back the re-start, winger Richard Streets chased, gathered and streaked down the touchline in at the corner and round to the posts. 10-0. Miki Zanirato knocked over a penalty for Combe after good work by the pack, but winger Streets was soon in at the corner again. Try converted, 17-3, then another penalty for the home side. 20-3. With half-time looming Combe were pressing in the left corner, but Hertford held out. Combe were still in the game. They had battled up the slope in the first half, their defence was just about holding, but they needed to make bigger inroads in the stubborn home defence. But such hopes were quickly dashed. Hertford’s prop escaped from the back of a line-out on Combe’s twenty-two to set up quick ball out to the left wing, Richard Allan, over in the corner, no conversion, 25-3. Playing down the slope it was now uphill for Combe, thirty minutes or so still to go. But Combe were still game. Get in the opposition twenty-two there would be chances. Will Robinson made another break, and had Dan Fox in support only to be brought down by a last gasp tap tackle. As Hertford tried to run the ball out from their own line, Combe’s winger off the bench, Michael Dowding stole an interception, and forced his way over. Miki Zanirato added the conversion. 25-10. But Hertford’s reply was immediate, again from quick ball spun wide. Their winger off the bench, Kyle Lemon was over in the corner and round to the posts. In-off the upright conversion, 32-10. It now gets a bit frantic, up and down, side to side, back and forth. A quickly taken line-out by Hertford sees them soon up the other end and Lemon squeezes in at the corner for his second. Try converted. 39-10. Into the last quarter. Hertford have the game won, but will not come close again as Combe stake a position in the opposition half. Dan Hamilton is now prominent. He almost puts in Michael Dowding for another score, has a good counter attack, supports Miki Zanirato on a thrust. But Hertford are defending on the brink and over. It costs them two more yellow cards and a string of penalties, and their defence eventually succumbs. Dan Hamilton is in space down the left, and he still has work to do, but makes it over and round to the posts, to give Miki Zanirato an easy shot for a conversion. 39-17. Full time. It was a better performance by Combe despite the scoreline suggesting otherwise. They had come up against a good side on good form. Next week Combe are at home to second in the table, Barnes, kick-off 2.00pm (TBC), preceded by a Supporters’ Lunch. 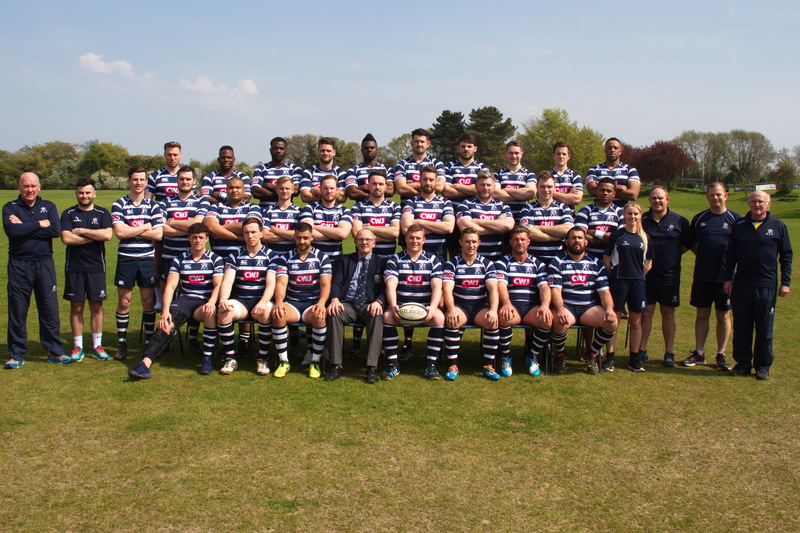 Westcombe Park XV: B. Bateup; J. Livett, B. Saffery, D. Bonner, D. Hamilton; W. Robinson, M. Zanirato; J. Saunders, J. Bonner, J. Forsyth, T. Calohard, T. Christopher, C. Scott, D. Fox, C. O’Sullivan. Bench: J. Snape, J. Dennett, M. Dowding.